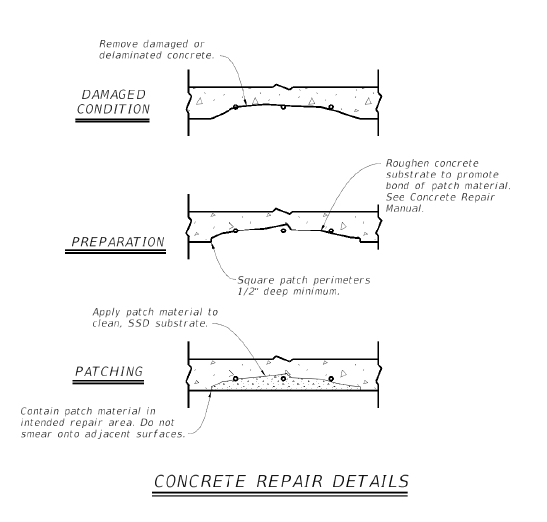 Most intermediate spalls, as defined in Section 1 of Chapter 2, are patched using proprietary, bagged concrete repair materials. Extending bagged cementitious repair material with coarse aggregate can significantly reduce the potential for shrinkage and cracking. When feasible, the Contractor should either use a pre-extended repair material or add coarse aggregate (typically pea gravel). Using extended material is often not practical when using trowel-applied materials in vertical and overhead applications. It is a common misconception that higher compressive strength equals a better patch. In reality, excessively high compressive strength can lead to early failure as a result of excessive loads being transferred into the patch material. Engineers and Contractors should typically select materials that have only enough strength for the intended use. In most cases intermediate spall repairs will be non-structural in nature, and therefore compatible or lower compressive strengths are beneficial. In general, slower strength development means better long term performance. Often, Contractors select rapid strength-gaining repair materials even when it is not necessary to do so. When it is practical, standard (non-rapid) strength-gaining materials should be selected. Batched concrete should generally be used when patching intermediate spalls in precast fabricator yards since it is readily available. Likewise, batched concrete should be used on construction sites when practical. Although bagged mixes can work well when applied correctly, batched concrete is typically a better alternative since the material properties will very closely match those of the parent concrete. Follow the provisions in Section 3 of Chapter 3 when using batched concrete to patch intermediate spalls. In highly congested areas, the largest of the coarse aggregate can be removed using a sieve to allow the material to flow adequately in the confined patch spaces. Either water or a proprietary liquid component supplied by the manufacturer. Only preapproved materials listed on the MPL for DMS 4655, Concrete Repair Materials, should be used on TxDOT projects. The MPL includes several repair categories. The Engineer should specify on the plans which category or categories are acceptable in specific applications. Use neat materials for applications up to 2 inches thick. Use extended materials for repairs exceeding 2 inches. Minimum application thickness can vary depending on the material and size of coarse aggregate (if applicable). Consult the manufacturer’s technical data to determine minimum thicknesses when determining minimum acceptable thickness, especially when working with extended materials. For vertical and overhead repairs, limit lift thickness to 2 inches or the maximum permitted by the repair material supplier, whichever is less. Roughen the surface of materials that will receive subsequent lifts, and ensure substrate is clean and saturated surface dry prior to placing additional repair material. Follow manufacturer’s published recommendations for storage including temperature and humidity controls. Do not expose material to the environment for extended periods of time. For projects with greater than 1000 square feet of concrete repair, store material off-site. For short durations, not to exceed three days, prepackaged material may be stored on-site but must be raised off the ground and covered in waterproof tarps. Material exposed to the environment and showing signs of packaging wear should not be used until tested and approved by Materials and Tests Division. Retain manufacturer lot tags with packaged date and shelf life for inspection prior to product use. Remove any damaged or loose concrete. Avoid damage to sound concrete that is to remain in place. Unless otherwise approved by the Engineer, use only hand tools or power-driven chipping hammers (15-lb. class maximum) to remove concrete. 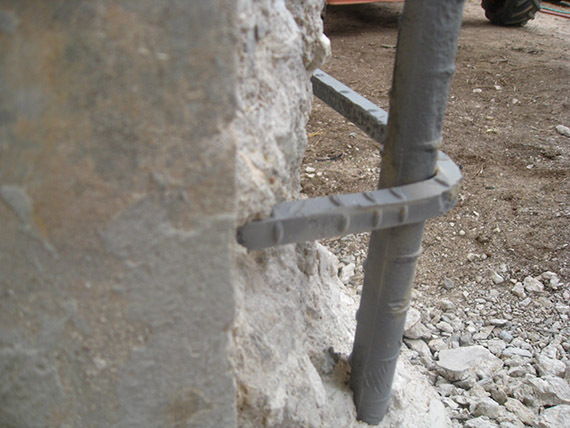 If more than 1/2 the perimeter of any mild reinforcement is exposed or if the exposed bar exhibits significant corrosion, remove the concrete from around the entire bar. Provide ¾-inch clearance or 1.5 times the largest sized aggregate in the repair material, whichever is greater, between the steel and surrounding concrete to permit adequate flow of the repair material. NOTE: A good rule of thumb is that adequate clearance is attained when you are able to wrap your fingers around the bar. Ensuring that you can grab the bar is a simple but highly effective method of ensuring there is adequate clearance to permit the repair material to flow around the exposed bar. Do not chip around prestressing strand that is exposed anywhere away from the immediate end of the member. Consult the Engineer when patching an area in which prestressing strands have been exposed. When repair dictates that chipping occur around exposed strands, the Contractor must avoid striking the strands directly or otherwise causing damage that could lead to wire or strand breaks. Use abrasive blasting or other approved technique to remove rust from exposed steel surfaces. Saw-cut the patch perimeters to eliminate feathered edges and to ensure that the repair material will be applied in depths no less than 1/2 inch. Handheld grinders or saws may be used to square the patch perimeters. Do not over-cut the patch perimeters at the corners of the repair areas. When practical, undercut the patch perimeter at an approximate angle of 30 degrees such that the profile will help hold the patch material in place. Roughen the substrate to ensure that there will be a mechanical bond between the patch material and the parent concrete. Though difficult to quantify and measure, Contractor should attempt to attain a minimum surface roughness profile of 1/8 inch or CSP (Concrete Surface Profile) 6 per ICRI. If the damage occurs at the end of a member and prestressing strand is exposed, recess the strands a minimum 3/8 inch using a torch or other approved method. Do not overheat or damage the surrounding concrete. Figure 3-2. Preparation (saw-cutting) straight and squared edges to contain patch material. Figure 3-3. Chipping hammer used to remove unsound concrete. Figure 3-4. Verifying adequate clearance around reinforcing. Figure 3-5. 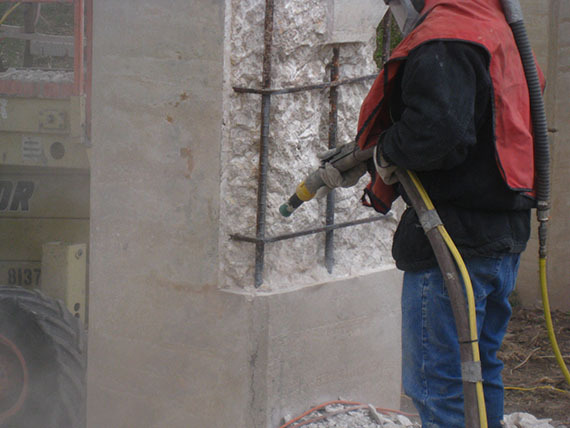 Abrasive blasting to clean reinforcing of rust/active corrosion. Figure 3-6. Reinforcing cleaned and free of rust. Figure 3-7. Pressurized water to clean and prepare surface (saturated surface dry). NOTE: In the past some Contractors and Fabricators opted not to recess prestressing strands in spalled areas so the protruding sections could serve as dowels for the patch material. While the strands would serve well as dowels in those circumstances, they could be exposed to moisture and chlorides if the patch fails over the life of the structure. For that reason it is more important that the strand be completely recessed. Install anchors to hold the patch material in place. Stainless steel expansion anchors. The Contractor may propose to use other anchors, such as galvanized or zinc-painted metal. The Engineer will review on a case-by-case basis. Rebar or threaded stainless steel pins (1/2-inch diameter minimum) anchored in place using TxDOT Type III anchoring adhesive. Remove any epoxy that leaks onto the patch substrate after the anchor is placed. Drill and clean the holes as required by the anchor manufacturer. Do not use a drill bit that has a larger diameter than that required. Embed the anchor the minimum amount required by the manufacturer. However, the anchor should not be driven further than necessary. In order to function as intended the head of the anchor must protrude into the repair material. Drill a hole 1/8 to 1/4 inch greater than the dowel diameter. Make the hole deep enough to permit a minimum 4-inch embedment of the dowel. Remove any contaminants from the hole using a brush or other mechanical cleaner. Just prior to installing the anchor, clean the hole using a high-pressure air compressor equipped with filters to remove all oil from the compressed air. Dry the concrete surface inside the hole prior to installing the dowel. Fill the hole approximately 1/3 full with the adhesive. Twist the dowel as it is inserted. Ensure that the space between the dowel and the concrete is completely filled with the adhesive. Remove all adhesive from the concrete surface that leaks from the hole after the dowel is inserted. NOTE: When using anchoring adhesives it is critical to properly drill and clean the anchor holes and to place a proper amount of material to keep the anchors in place. The drilled holes must be thoroughly cleaned which should include the use of clean high pressure air and mechanical brushing. Also, if there is too little adhesive, the anchor will not have enough pullout resistance. If there is too much adhesive, the material can leak out of the anchor hole and create a bond breaker on the patch substrate. It is imperative that the Contractor follow the manufacturer’s instructions and the above guidelines. Where anchors are installed, ensure that there will be a minimum cover of 1/2 inch for stainless steel and 1 inch for non-stainless steel after the patch material is applied. 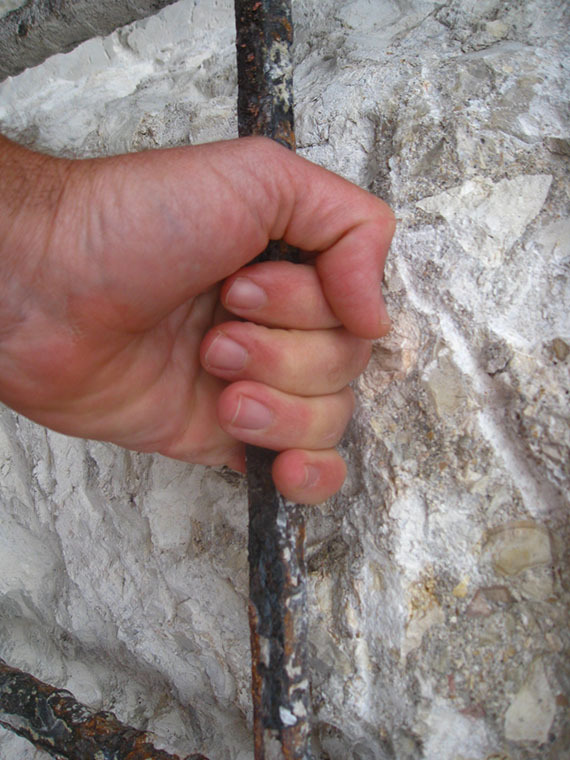 Oftentimes anchors or dowels do not protrude far enough from the concrete substrate, leaving large depths of patch material unanchored to the parent concrete. Contractor should install anchors with the exposed edge of the patch in mind, not the outside surface of the parent material. Substrates must be clean and sound. Remove any contaminants, including laitance, oil, dust, debris, or other foreign particles. Just prior to patching, blast the repair area using a high-pressure air compressor equipped with filters to remove all oil from the compressed air. For small applications (less than 1 cubic yard total) use measuring cups or containers to determine the proper quantity of each component per the manufacturer’s requirements, then dispense into a clean container. Mix the components thoroughly until they are well-blended (3 minutes minimum) using a low-speed electric drill (400 – 600 rpm) and a clean “Jiffy” type mixing paddle. Do not mix repair mortar or concrete by hand. Do not estimate the proper amounts while adding the different components. For vertical and overhead applications Contractors often need to limit the amount of water or liquid component in order to achieve a stiff mix. Consult the manufacturer’s literature for minimum requirements. If extending the mortar to produce concrete, add aggregate and mix in accordance with the manufacturer’s requirements. When mixing more than 1 cubic yard use a mortar mixer, volumetric mixer, or other method approved by the engineer. Contractor must submit detailed procedures on equipment type, proportioning methods, minimum mixing time, and placement. 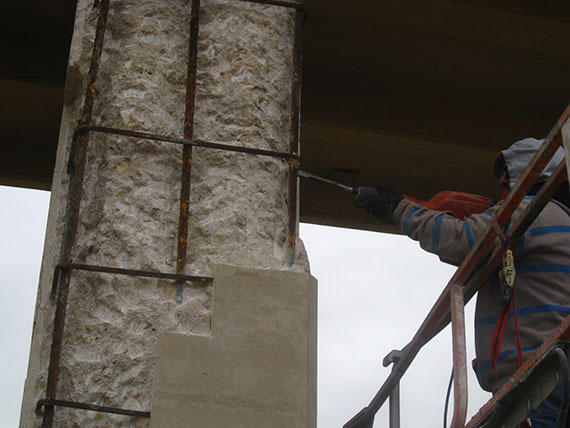 Many cementitious repair materials have relatively short working times (15 to 30 minutes). Do not mix materials until the surface preparation is complete and the substrate is ready for application of the repair material. Mix only the amount of material necessary for immediate application. Review water requirements and temperatures. If the dry materials are left out in the environment, they can easily reach 90°F or higher. In cases where dry materials have elevated temperature, use cooled mix water to ensure workability. When performing repairs between the months of April and September, having ice to add to the mix water or using chilled water should be normal. It is much easier to use cooler patch repair material. Note that all the material set time and workability time shown on the material's product datasheet is based on a laboratory room temperature of 70°F. Do not attempt to make the material workable by over-mixing or adding additional liquid after it has begun to set. Over-mixing material that has begun to set can reduce the compressive strength and increase the permeability of the material. Exceeding maximum water content is bad for long term performance of patch material. The beneficial properties of bagged mixes are often lost when the repair material is retempered. Retempering of bagged mixes will not be permitted. Hot and cold weather application. The temperature of the patch material and the concrete substrate at the time of application must be between 40°F and 95°F. Contractor must also adhere to manufacturer limits if they are more stringent. Do not apply patch material when the ambient temperature in the shade is below 40°F and falling. Patch material may be placed when the ambient temperature in the shade is 35°F and rising or above 40°F. Shade the repair material components and the patch substrate if the ambient temperature is above 100°F. Pond water over the substrate for a minimum of 24 hours. 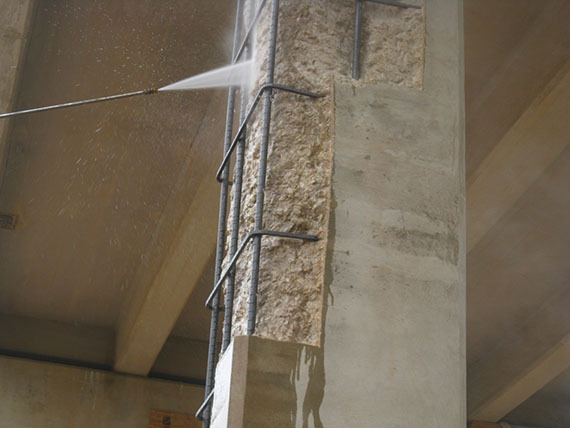 Several minutes before patching, apply high-pressure water blast to the surface for a brief period (1 or 2 minutes depending on the porosity of the concrete). An SSD condition is achieved if the surface remains damp until the patch material is applied. Surface may be damp, but must be free of standing water. Do not use a proprietary epoxy bonding layer in lieu of an SSD substrate unless approved by the Engineer. If use of a proprietary bonding agent is authorized, mix it in accordance with the manufacturer’s requirements. Use only TxDOT approved Type V or Type VII material (refer to DMS 6100 – Epoxies and Adhesives). Apply over a bonding layer, which typically consists of a scrub coat brushed into the SSD substrate. The scrub coat consists of a thin layer of repair mortar that is pushed into the surface using a stiff brush, completely covering the substrate and filling all voids. Ensure that there is not an excess amount of water on the brush used to apply the scrub coat. Do not dilute the scrub coat material with additional liquid. Apply the repair material while the bonding layer is still wet (scrub coat) or tacky (proprietary bonding layer). Apply in minimum 1/2-inch and maximum 1 1/2–inch lifts unless otherwise approved by the Engineer. For multiple lift applications, roughen the surface of the preceding lift before it has reached initial set. Wait until the preceding lift has reached initial set (30 minutes minimum) to prevent sagging prior to applying the next lift. Wet the surface just prior to applying the subsequent lift. Prepare and install the forms prior to mixing the repair material. Ensure that forms are tight enough to prevent grout leakage. Place the repair material in the forms while the bonding layer is still wet (scrub coat) or tacky (epoxy). Consolidate the material by rodding, vibrating, and/or hammering the forms. Do not over-vibrate the mix. If required by the Engineer, determine the compressive strength of the patch material by making concrete test cylinders or mortar cubes. Failures often occur in cement-based repair materials due to inadequate curing. Large plastic shrinkage cracks can develop if rapid moisture loss occurs before the patch has the capacity to resist tensile loads that develop as a result of the shrinkage. Drying shrinkage can lead to elevated stress levels that cause cracking within the repair material or at the bond line between the patch and the parent concrete. It is paramount to the long-term success of the repair that proper moist curing commence as soon as possible after application of the repair material, and that it continue for a sufficient amount of time thereafter. After placing repair material, moist cure exposed patch material surfaces for a minimum of 72 hours using wet mats, water spray, or ponding. Do not use a curing compound in lieu of moist curing unless approved by the Engineer. Curing compound will only be considered for use when water curing will be unnecessarily burdensome and when allowed by manufacturer literature. If use of a curing compound is authorized, any remaining residue must be completely removed after the required curing period. In form-and-pour applications, leave forms in place for a minimum of 72 hours after placing the repair material. Place wet mats on exposed sections and over the openings used to place the material. The Engineer may reduce required curing time in some cases, such as when there is a need to return the member to service quickly or when CFRP will be placed over the patch material. Do not allow concrete surfaces to become dry during the specified moist curing period. Ensure that wet mats are kept wet during the entire cycle. Insulate the patch material to ensure that there is adequate heat for curing if ambient temperature is expected to fall below 50°F. If using artificial heating methods, do not heat the air around the repair material to above 130°F. After curing, the repair area will be inspected visually for cracking and sounded by the inspector with firm hammer blows to ensure the repair has adequate bond without cracking and is free of soft or other unsound material. Acceptance of the repair will be based on the findings of this inspection. Ensure that the patches closely resemble the surrounding concrete. Finish patch work as outlined in Item 427, Section 4.3.4 for Off-the-Form Finish. Blend in the repair area if after completing the work the patch material does not closely resemble the surrounding concrete. The Contractor may use a slurry coat finish in accordance with Item 427 to blend in the patch. The Engineer will review other methods proposed for blending patches. Patches should not be easily discernible if viewed from more than 25 feet away. When feasible, batched concrete is typically the best option for repairing intermediate spalls. However, it is often not practical to use batched concrete when working on existing structures or, in some cases, on construction sites. Using bagged mixes is also necessary when either trowel-applied or flowable form-and-pour mortar is needed in highly congested or thin applications. Proprietary cementitious repair materials can work effectively if applied correctly. Each step in the repair process (preparation, proportioning, mixing, application, and curing) is critical in the overall performance of the patch material. 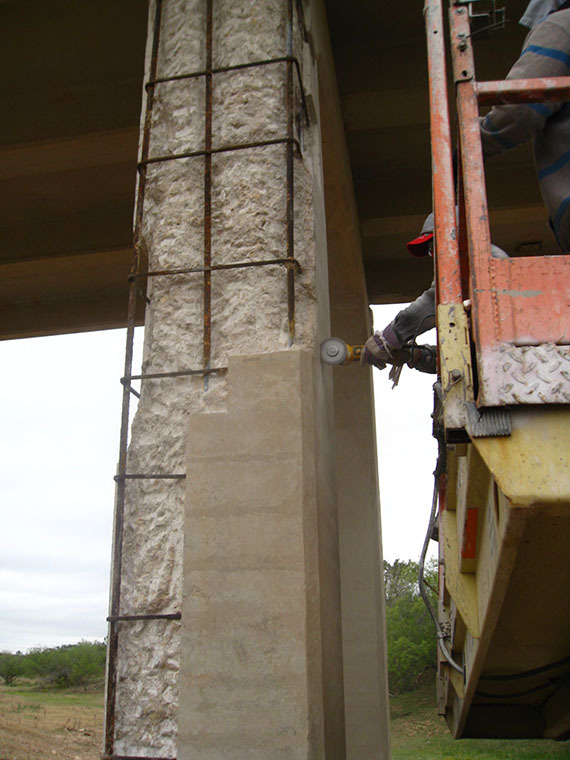 The requirements set forth in DMS 4655, Concrete Repair Materials, ensure that only high quality materials will be added to TxDOT’s preapproved list. It is imperative that Contractors only use concrete repair materials that have been preapproved for the given application.